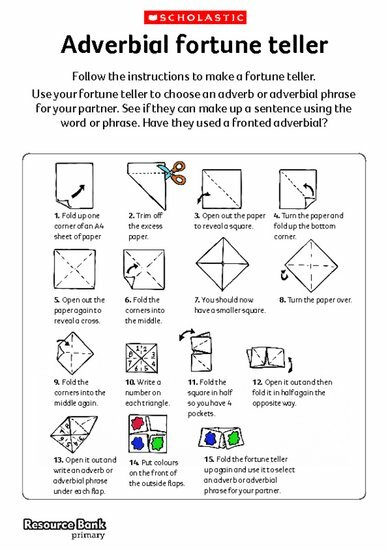 Give children copies of the fortune teller instructions and show them how to fold a square of paper to form a fortune teller. To play, each child should pair up with a friend. The friend first chooses a colour on the fortune teller, and the child operating it spells out that colour, opening and closing the fortune teller as each letter is spoken. They then invite the friend to choose one of the numbers displayed, and open and close the fortune teller that many times, before asking the friend to choose a second number. The corresponding flap should then be opened to reveal the friend’s ‘fortune’ – an adverb or adverbial phrase that he or she must use in a sentence. The first child should listen carefully, and tell their friend whether they gave an example of a fronted adverbial or not.